A deliciously spiced twist on a plain favorite. Place sweet potatoes on a baking sheet and bake for 1 hour or until soft. Remove from oven and let stand until cool enough to handle. Split potatoes and remove the sweet potato insides to a medium sized bowl, reserving skins. In another bowl, add brown sugar, butter, sour cream and spices. Mash together. Gently combine the sweet potato insides and butter and sour cream mixture . 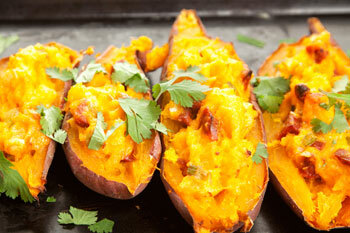 Add the filling back inside the sweet potato skins and place on a baking sheet.